How lucky we are that corn and tomatoes are in season at the same time, because there is nothing better than an ear of buttered sweet corn next to sun ripened sliced tomatoes on your plate, adorned with nothing but a light sprinkle of your favorite salt. This entry was posted in condiments, gluten free, salads, side dishes, summer, vegan, vegetarian and tagged avocado salads, corn and avocado salads, corn and tomato salads, corn salads, green curry recipes, green curry vinaigrette, tomato and avocado salads, tomato salads on August 27, 2016 by Michele Humlan. A few years back I had the idea of growing my own blueberries. With sun gracing only the deck and mostly shade covering my yard, the blueberry bushes would be in large deck pots. I was warned by the neighborhood berry growers that critters loved blueberries and netting around each plant was the only method to deter poachers. 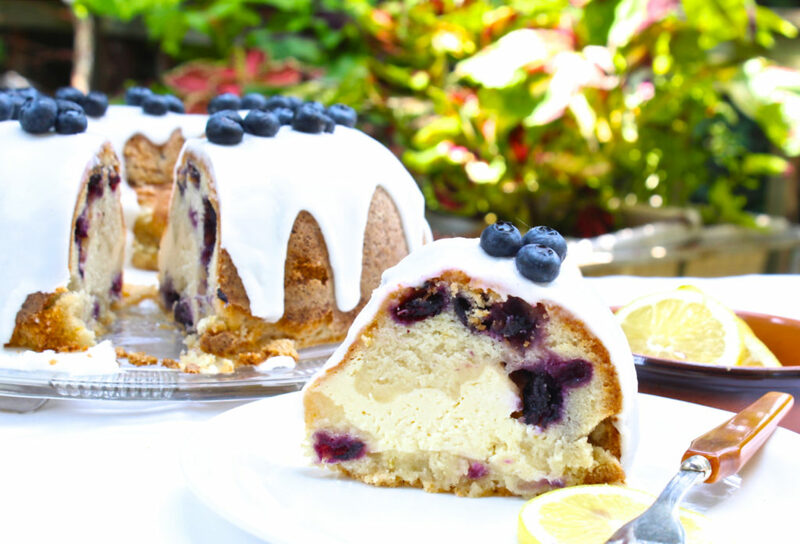 This entry was posted in desserts, gluten free, summer, vegetarian and tagged blueberry cake, blueberry desserts, blueberry lemon cake, cream cheese cakes, gluten free blueberry cakes, gluten free lemon blueberry cake, lemon cake on August 13, 2016 by Michele Humlan.